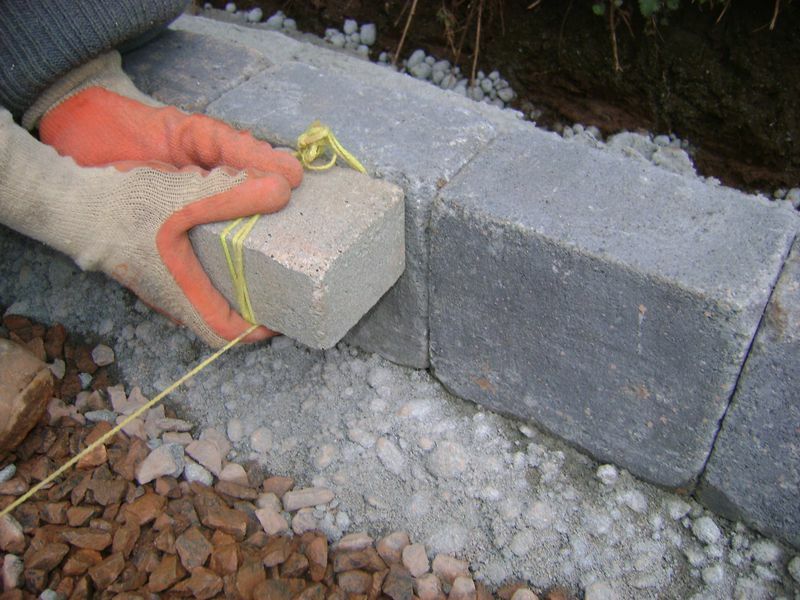 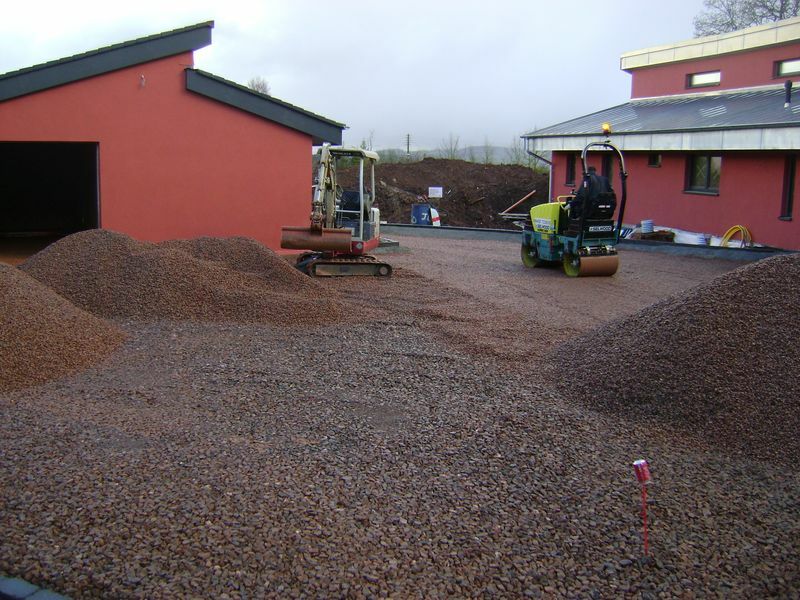 The contents of this page shows how we install kerbs, kerb, road kerbs, kerb installers, road edgings, kerb stones, block kerbs, standard kerbs, edging kerbs, block paving edging kerb, edge restraint in Exeter, Devon. 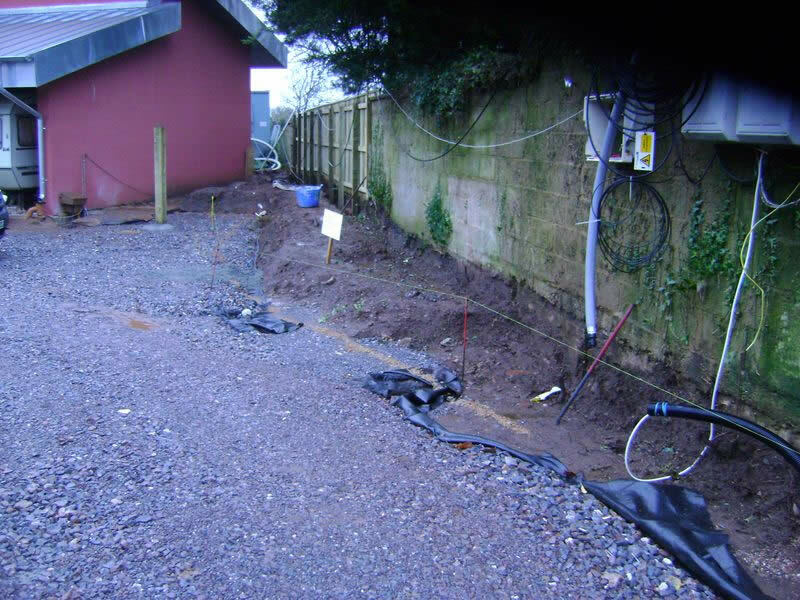 THIS PROJECT IS UNDER PERMEABLE DRIVEWAY CONSTRUCTION, CLICK HER E TO VIEW DAY 2 IMAGES. 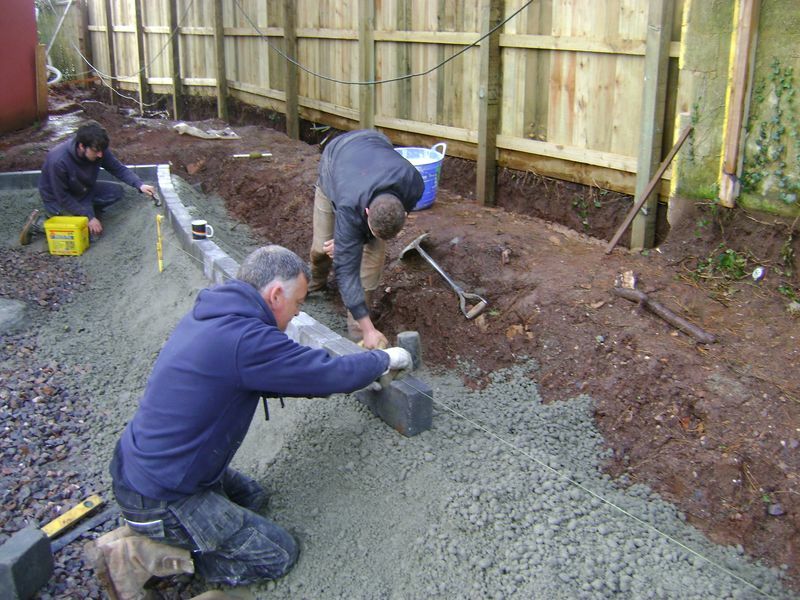 The concrete is poured straight from the shute to the required levels and position, an edging kerb is used to check the correct levels or a marking on the shovel. 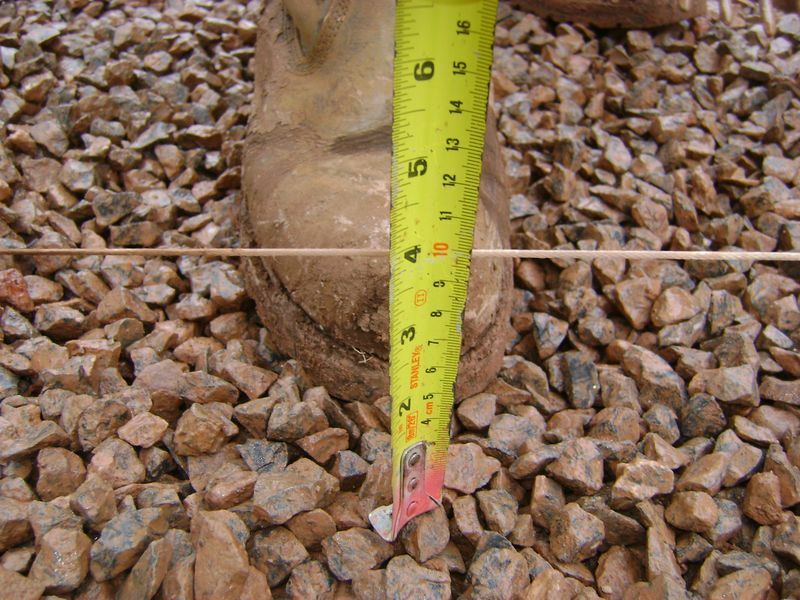 The kerbstones are installed on the concrtete bedding and haunched at the rear of the kerb, all kerbs are installed level and to the string line. 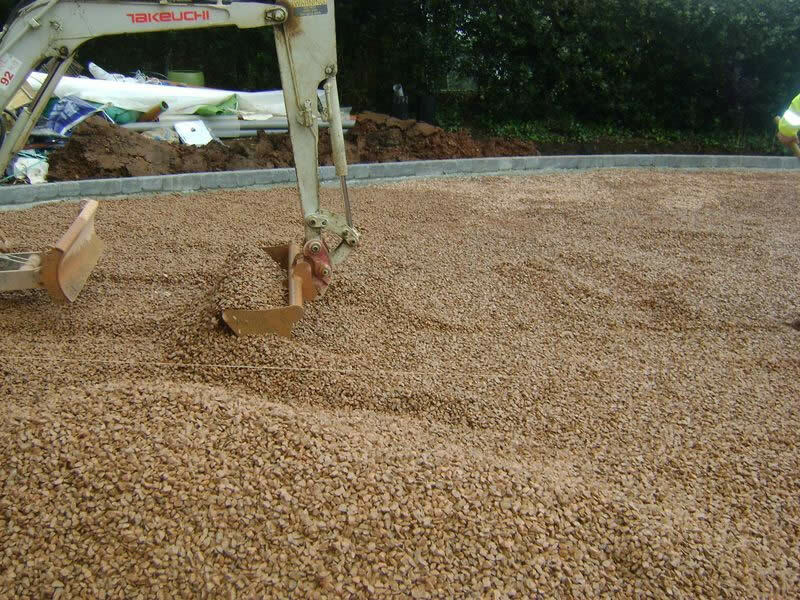 As the edge restraints are installed they are cleaned of concrete immediately. 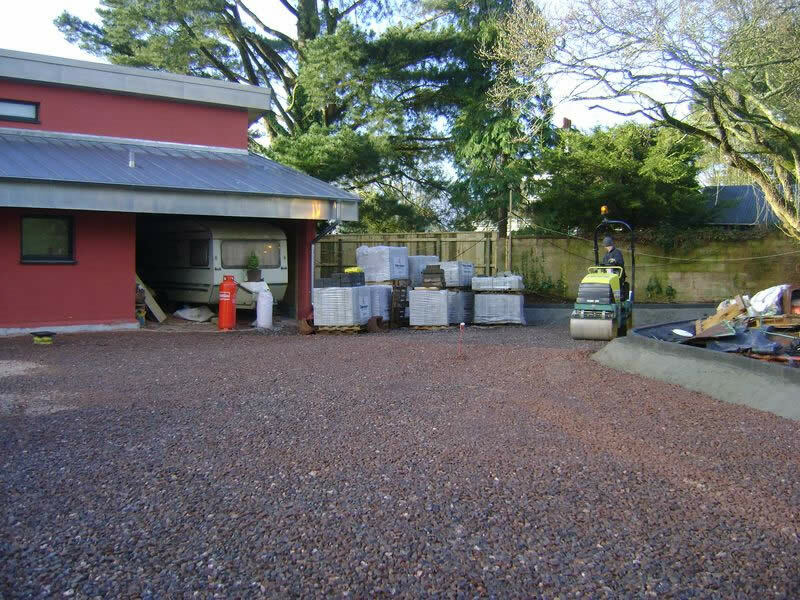 The levels have now been brought up to the required 300mm below FFL, the Bomag roller has compacted the stone, lines and levels have been used to dip the lower sub base and the make up required sprayed on the floor for the excavator driver to see has much make up is required. 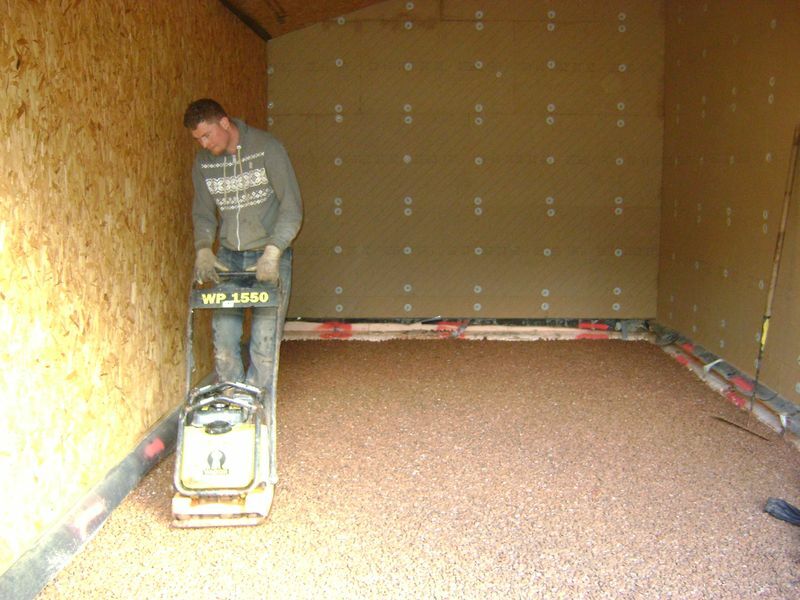 The first of two garages has the 20mm stone installed in two layers, the perimeters are consolidated with a wacker plate. 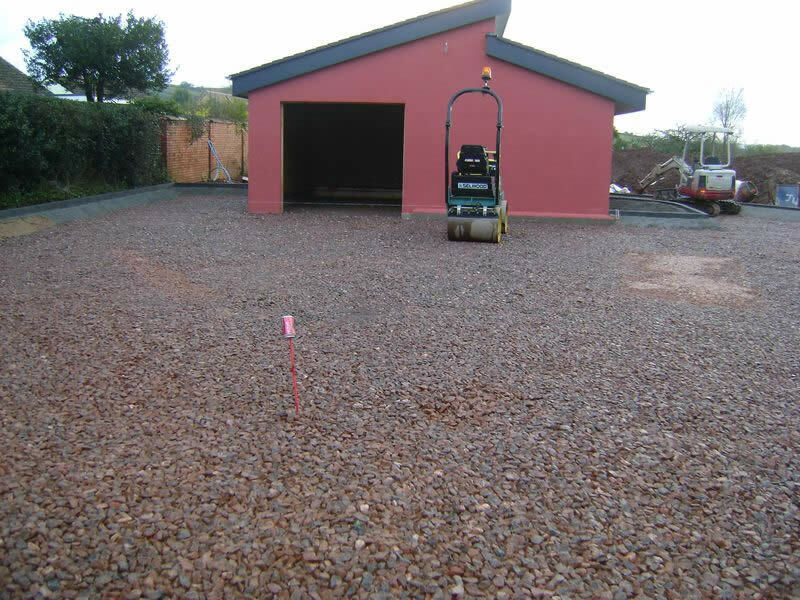 I will save the installation of both garages for rainy days but the preparation is undertaken first. 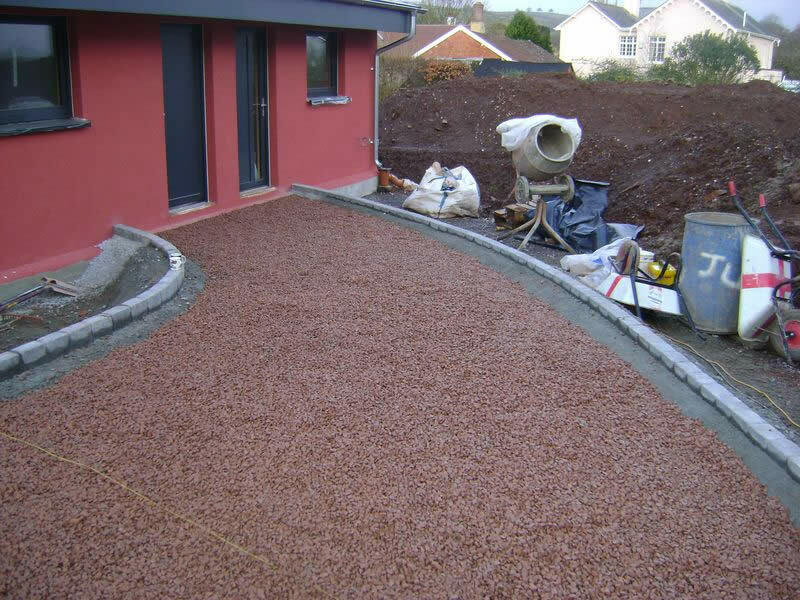 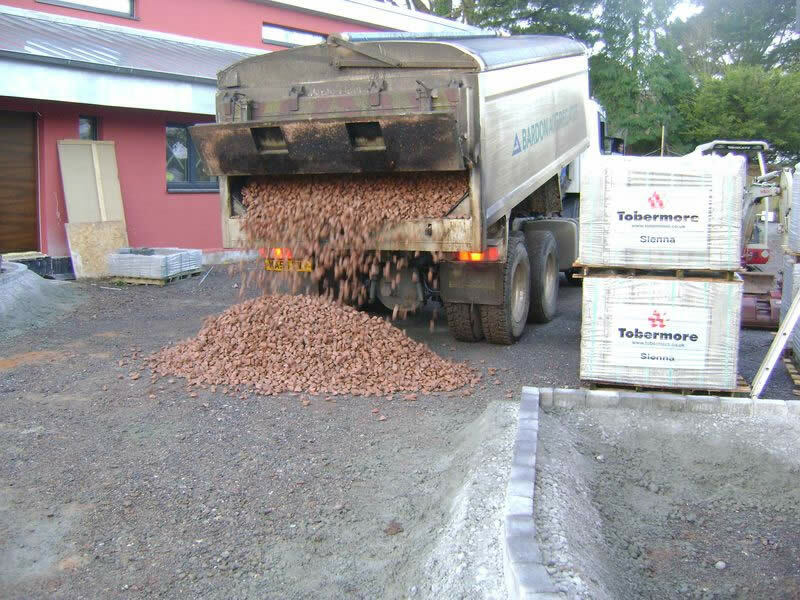 Once the first layer of 100mm stone is installed and consolidated the second 100mm layer is installed to 90mm below FFL. 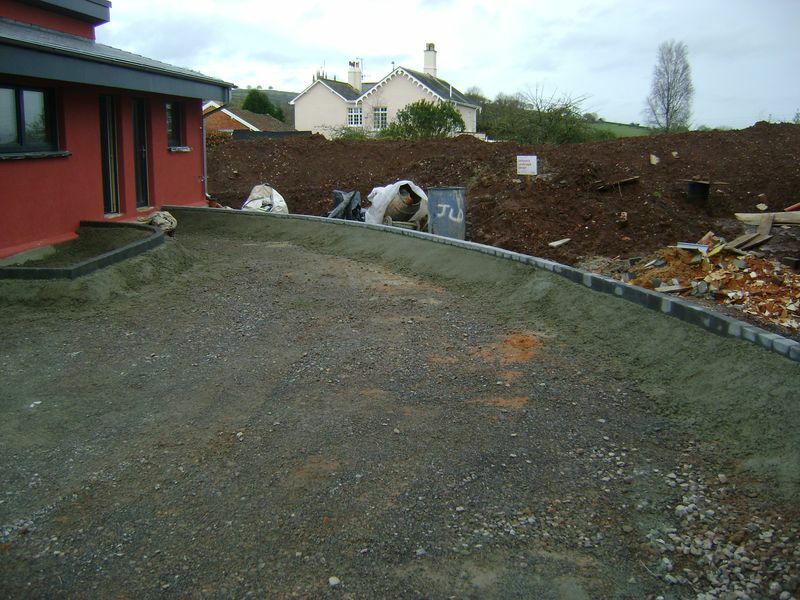 Extreme care is taken when using the rolloer near the zinc roofing, soffits, gutters and down pipe, all perimeters have the compaction plate to consolidate. 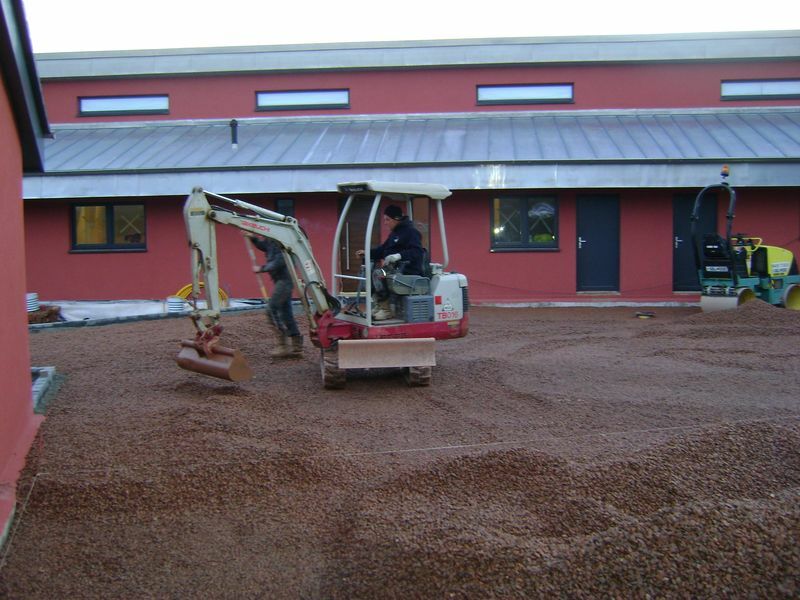 The second layer of stone installed at 90mm below FFL just needs to be consolidated before the next stage. 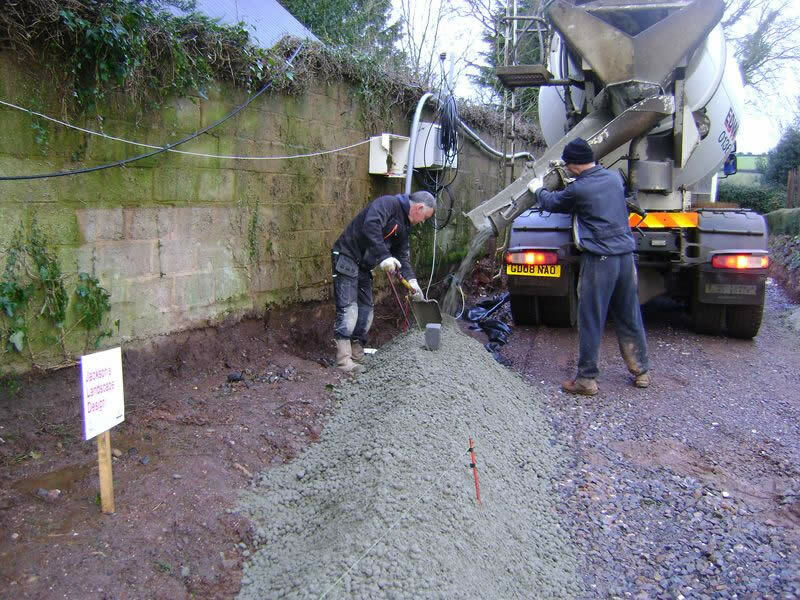 Works continue to install the second 100mm upper sub base layer, the bulk of the stone is moved swiftly with the excavator, once shifted we return back to the start and grade the stone off to the required depths and levels.